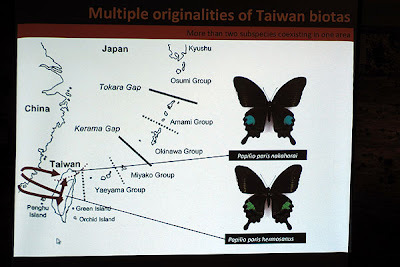 On Saturday, 7 Nov 09, four ButterflyCircle members were invited to a guest lecture by Assoc Prof Yen Shen Horn of the Department of Biological Sciences, National Sun Yat Sen University in Kaohsiung, Taiwan. The invitation to this very interesting talk was courtesy of Dr Leong Tzi Ming of the National Parks Board. 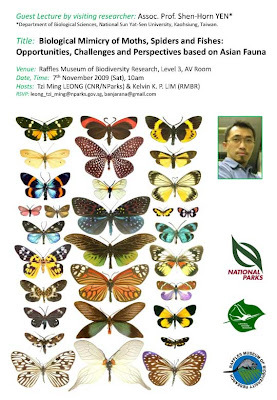 Dr Leong, an avid lepidopterist, has published many papers on the on-line version of the Raffles Bulletin, Nature in Singapore. 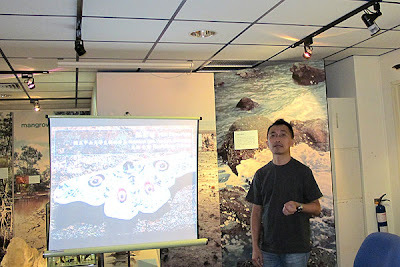 Held at the exhibition area of the Raffles Museum of Biodiversity in a rather informal setting, A/Prof Yen held the small audience engaged in a very informative talk that lasted for over one and a half hours. A/P Yen first shared with the audience what he and his department are currently focusing, in terms of research projects. Whilst many of the topics are highly academic and research type, it also expanded my outlook towards the depth of research that many experts like A/P Yen was doing. 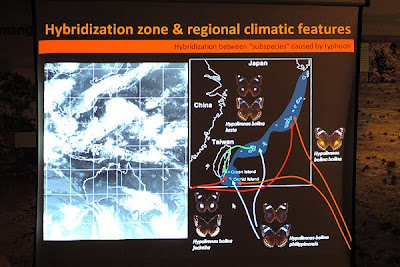 He also discussed the hybridization zone and climatic features affecting Hypolimnas bolina. An intriguing point that he made about H. bolina also corresponded with what I'd always also wondered about this species - that the subspecies that occur in Singapore and Malaysia could well be different forms as well. Over the past two decades, we've found the return of the subspecies jacintha and appears to have overrun the more common subspecies bolina in recent years. In the mid 90's the latter subspecies was a lot more common, but now appears to be very much rarer, with the subspecies jacintha making more frequent appearances. 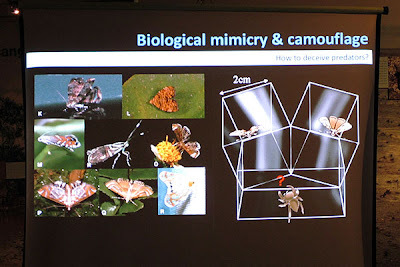 A/P Yen then went on to discuss the theory of mimicry as expounded by the early researchers, Henry Walter Bates (1825-1892) and Dr Fritz Muller (1821 - 1897), and also the theories of Edward Bagnall Poulton, who offered his own theories about mimicry during the same era. 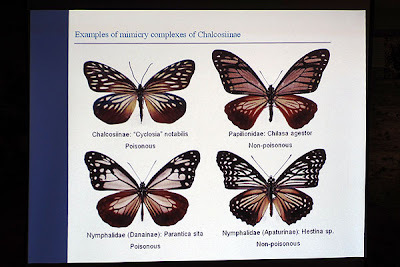 The discussion covered aposematism and what A/P Yen mentioned about the general reference to warning colouration in public talks is quite true - that an organism that is inherently colourful or with a flashy display of colours, is not necessarily exhibiting the fact that it is poisonous. 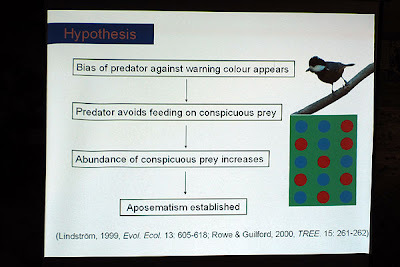 Also very interesting, were the studies that A/P and his co-researchers did of the Jumping Spiders and their preference of preys in a controlled environment. 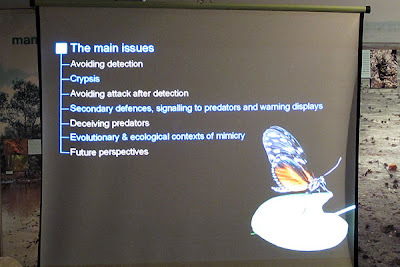 One of the slides also depicted the many day-flying moths that ButterflyCircle members often encounter when out in the field. These moths, largely from the family Chalcosiinae, are often the models for other Lepidoptera mimic for protection against predators. It is also interesting to see that many butterflies (and moths) look very much like many of the moth species from this family. 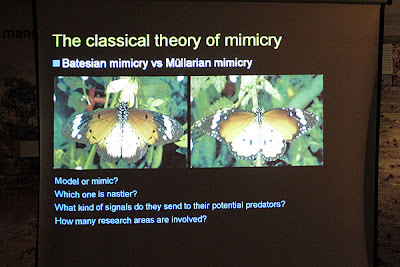 Many good examples of both Batesian and Mullerian mimicry strategies are found amongst these species. 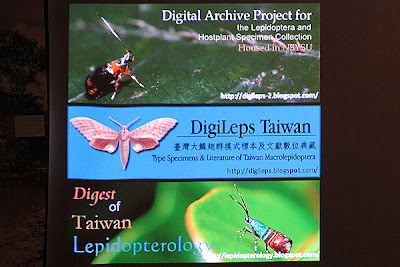 A/P Yen also shared some digital resources of Lepidoptera in Taiwan. A few of the URLs are shown in the slide below. There are also many other projects and resources indicated in A/P Yen's CV. A particularly interesting one is the database of Global Butterfly Names. 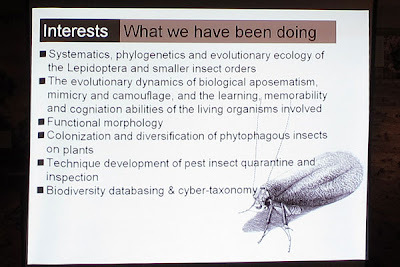 The talk ended with a lot of thought-provoking issues on Lepidoptera research and questions that remain unanswered in this very fascinating subject. As ButterflyCircle comprise of mainly amateurs and hobbyists, though with more than a fleeting interest in butterflies, there is definitely a lot more ground to cover , and mysteries to unravel in the world of our Flying Jewels. 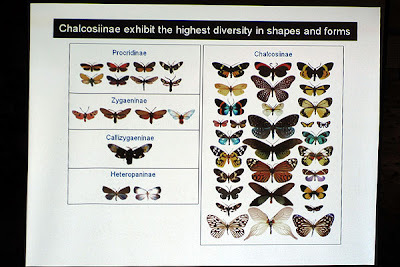 A/P Yen, Dr Leong TM and the BC members then visited the Raffles Museum of Biodiversity Research's lepidoptera collection and spent some time sharing anecdotes and experiences about the butterflies and moths in the collection.